The list of things to do in Khao Lak is endless and below we briefly discuss just a few of its attractions. With its sublime beaches and placid ocean it is the ideal destination for a romantic holiday, nature lovers, scuba divers and people who prefer to dodge mainstream crowds. It is subsequently one of the best honeymoon destinations in Thailand and also offer a host of family friendly activities. Tour operators in the town centre and most hotels will be happy to arrange sightseeing trips. Especially our 5 star hotels in Khao Lak will have their own tour counters which guarantee you book your adventure with a reputable operator. 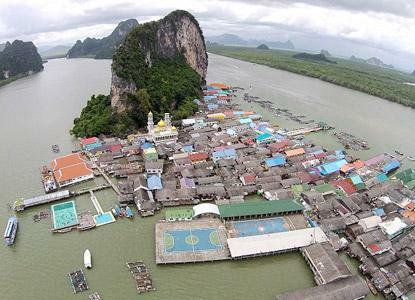 James Bond island made famous for featuring in the movie "Man with a Golden Gun" and Koh Panyi which is a Sea Gypsy Island built on stilts over the water by Indonesian fisherman is located in Phan Nga. You can visit both in one day trip, have lunch at Koh Phanyi and buy souvenirs, hand craft and clothes. Snorkeling is great fun for the whole family. Here you will be able to observe banner fish, lion fish, parrot fish and a huge array of other reef fish. 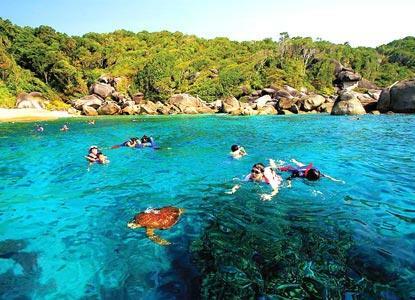 Take a long tail boat trip to Khao Na Yak reef just off the coast to see some colorful fish and coral gardens or join on a trip to nearby Surin and Similan Islands .